On the left hand ring finger now sits a stunning bit of bling and yes, I can’t stop staring at it!!! Yesterday I found myself in a mall and somehow, my feet found their way to a jewellery store. There were two rings I’d been torn between and as I walked in, the first ring I noticed was the Option B I’d decided against. When I saw the ring in the flesh, it was love at first sight. I knew he’d bought the other ring though so what to do?! Call him of course! Lol. I told him I wasn’t sure which one I wanted anymore. The poor guy sighed, asked where I was and came to pick me up from the mall. We drove to his house and he went upstairs to ‘get something’. I was waiting for him at the foot of the stairs and lo and behold, he appeared holding a box in his hand. We stared at each other for what seemed like an eternity… and then burst out laughing. We couldn’t stop laughing for a good 10mins. When we finally composed ourselves, he went down on one knee and I tell you, the atmosphere changed. Suddenly he turned serious and I was blushing like the sun sits on my cheeks. 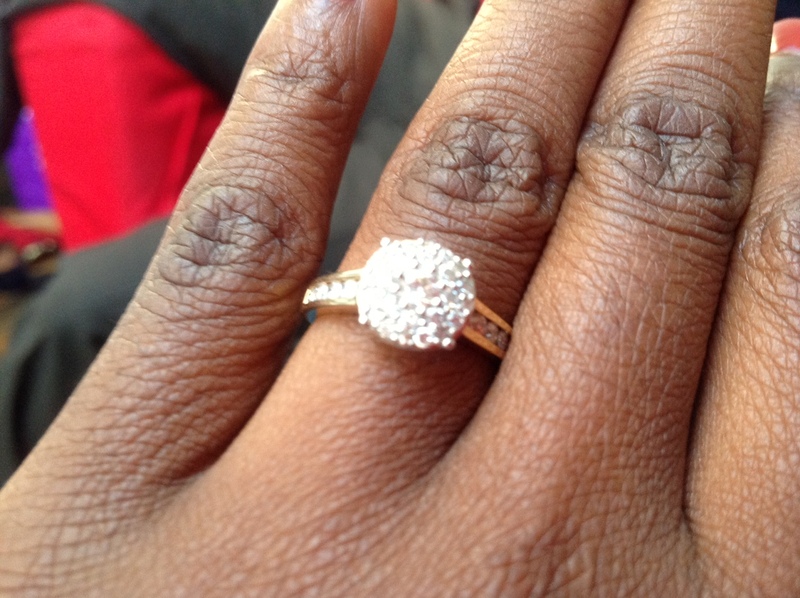 Even though I knew he was going to propose, when he got down on one knee, I promise you, I was in shock! He was nervous as heck; his hands were unsteady; but he gave the most eloquent speech of his life and l REMEMBER EVERY WORD!!! He had a nice romantic proposal all planned. He was going to turn up outside my house early this morning, sprinkle rose petals on the path to my door and have a bunch of flowers waiting for me so that when I opened the door to head out to work, I’d get the shock of my life. Sorry for ruining that plan babe! Lol. After he proposed, I still had the dilemma of which ring to settle for. In the end we went to the store together and the moment I put the option B on, I knew it was the one. How crusty does my skin look?! LOL. Ladies and gentlemen, I AM GETTING MARRIED!! !